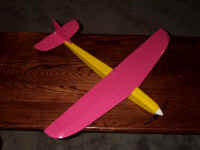 Paul's Planes Speedster 400 page! The Speedster 400 is a 115 sq." pylon racer built from plans by Jonas Leander http://www.i.kth.se/i96_les/ of Stockholm, Sweden. My Speedster weighs 3- 3/4 oz. complete before any covering or electronics. I made a few minor modifications to Jonas's plans. First is the bolt on, rather than tape on wing. 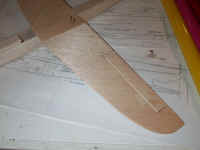 Second is the bias grain sheeting on the wing bottom and the basswood trailing edge. 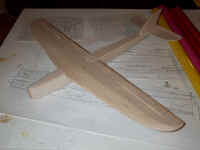 When I carved and sanded the wing to shape it ended up way too thin, but had a good shape on the upper surface. 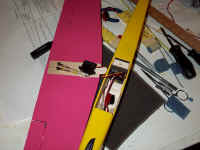 To solve this I trimmed off some trailing edge material and added a thin bass strip, and sheeted the wing with 1/32" balsa on the bottom after I added the aileron torque rods. This greatly strengthened the trailing edge and wing tips. Equipment is a 7.2v S400 with a Graupner 6x3 prop, Aveox A-15 ESC, Hitec 555 micro Rx, (2) Hitec HS-81 servos, and 7x600AR and 8x600AR batteries. 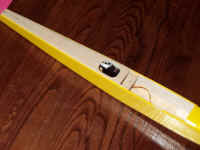 The plane is covered in Monokote and the complete weight is 15.5 oz. with the 8 cell battery.